Facilities: Superb modern six-lane pool attached to public school. Small gallery for a dozen or so spectators. There are often exercise classes in an adjoining studio and membership of the sports centre gives access to a range of other activities. Directions from Reading: Leave town on the A4 towards Newbury and cross the M4 at Junction 12 (just after Savacentre). Turn right at the second large roundabout, signposted Pangbourne. Turn left almost immediately and follow this road for around 2 miles into Bradfield. At the bottom of the hill into the village, turn right and the sports centre entrance is about 200 yards on the left. Directions from M4: Leave the M4 at Junction 12, taking the A4 towards Newbury. Turn right at the second large roundabout, signposted Pangbourne. Turn left almost immediately and follow this road for around 2 miles into Bradfield. At the bottom of the hill into the village, turn right and the sports centre entrance is about 200 yards on the left. Directions from Tilehurst: Go past Hall Place Equestrian Centre down Sulham Hill. Turn left at the Greyhound in Tidmarsh, after about two miles, follow this road for about a mile, crossing the M4, and take the next right. The entrance to the sports centre is on the right as you come into Bradfield after a further mile or so. Ample parking. Facilities: Small modern 4 lane 25m pool, detached in grounds of girls’ boarding school. Limited poolside benches, and outdoor shoes are banned on poolside. Please note parents are not allowed to sit out sessions in the car park. Directions: From Caversham centre, up Prospect Street and bear right along Henley Rd at the traffic lights by the Prince of Wales (or up Westfield Rd and turn right). The school entrance is about 200 yards on the left, as the road dips. From Woodley/Earley and points east, it may be easier to go through Sonning and follow Henley Rd into Caversham. Directions: On Northumberland Avenue opposite the John Madejski Academy. Not far from Junction 11 of the M4. Further information can be found on the Academy Sports website. Facilities: Bright, 4-lane modern 25-metre pool. Small spectator area. Directions: Leave Reading on the A4 towards Newbury. After passing Prospect Park on the right, turn left at the Burghfield Rd junction. Follow this for around three miles through Burghfield to Burghfield Common. Straight over the roundabout, turn right at the lights by the Rising Sun pub and the school is a couple of hundred yards on the right. Alternatively, from Junction 12 of the M4, take the A4 towards Newbury, straight over the two roundabouts, and turn left - signposted Willink Leisure Centre - follow the signs. Finally, if entering Burghfield Common from the East rather than the North, go straight across with the pub on your left. Note: GPS / SAT NAV users should note the Post Code is for the centre's admin block - about a mile away! Look for Rawlinson Road, Aldershot. Facilities: Outstanding 8 lane 50m long-course venue used by national, district age and development 2 squads, as well as Masters. Directions: Leave Reading on the A33 towards Basingstoke and turn left immediately at the end of the Swallowfield Bypass. Right at the first roundabout and left at the next; follow this road into Hartley Wintney. Turn left at the foot of the hill into the village and right after about 100 yards at the mini-roundabout; follow this road into Fleet. Go straight over the crossroads in the town centre (right-hand lane to approach it) and at the next set of lights turn left (signposted Pyestock). Turn right at the next set of lights and follow this road into Aldershot, passing the airborne forces museum (Dakota parked outside) as you enter the town. Left at the next set of lights and next right into Princes Drive; the pool is the long, low building at the bottom of the drive on the left. Ample parking. Note: The pool is a military facility and it is important that users can be identified. Users should take out membership (nominal fee - ID cards issued on the spot) and sign in. Traffic control in the area is in the hands of the military police and speed checks are common. Leave at Junction 12 and follow ‘A4 Theale’. After about 2 kilometres turn right at the roundabout onto the ‘A340 Pangbourne’ road. After about 4 kilometres enter the village of Tidmarsh and turn left opposite The Greyhound public house and just after the speed camera into Tidmarsh Lane, signposted ‘St Andrew's School’. After 3 kilometres turn left into the School drive. Those coming from Reading, Purley, Goring, Streatley, Whitchurch and the surrounding area should make for Pangbourne. If entering Pangbourne on the A329 go over the first mini roundabout (first exit) and if coming over the Whitchurch bridge (B471) you will approach the same mini-roundabout and need to take the second exit. Take the first exit (left) at the next mini-roundabout (opposite The Elephant pub) onto the A340 towards Theale, and then almost immediately turn right (just after The Cross Keys pub) up Pangbourne Hill. This is signposted ‘Pangbourne College’ but drive past the College entrance and keep on the same road for about 4 kilometres and turn left (signposted ‘St Andrew's School’); at the first junction keep left and then turn immediately right into the School drive. If coming along the A329 from Streatley/Goring drive past the train station, under the railway bridge and then over (2nd exit) the mini-roundabout opposite The Elephant pub and then almost immediately turn right (just after The Cross Keys pub) up Pangbourne Hill. This is signposted ‘Pangbourne College’, but drive past the college and keep on the same road for about 4 kilometres and turn left (signposted ‘St Andrew's School’) and at the first junction keep left and then turn immediately right into the School drive. The drive is a kilometre long and will bring you to the car park at the front of the School. 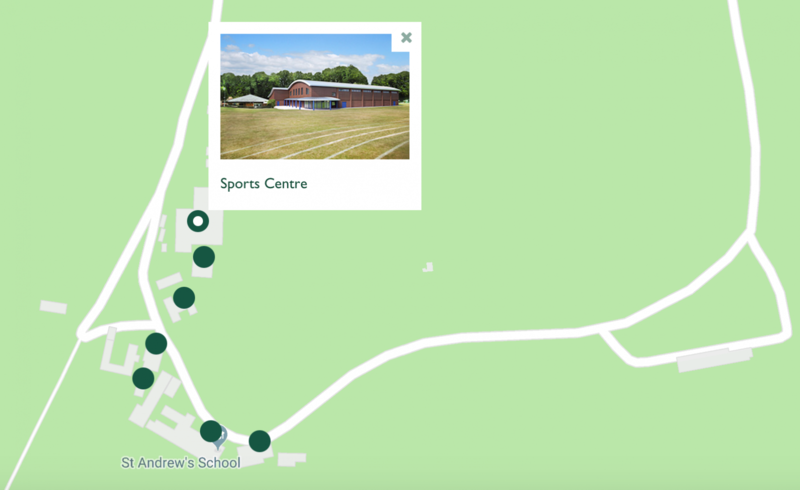 Keep following the drive round (you will see the Sports Centre to the right) which will take you towards the back of the Sport Centre to park. Spectators must remain behind the barrier in the tiered seating area only. No outdoor footwear is permitted on poolside. No prams/buggies are permitted in the Sport Centre; they should be stored outside the Sports Centre, under the covered walkway. Food is prohibited in the swimming pool, spectator area and changing rooms. Chewing gum is prohibited in the Sport Centre. Smoking is prohibited on the School’s premises. No glass bottles etc. allowed in the Sports Centre (plastic containers only). Swimming hats should be worn by all swimmers. Swimmers MUST shower before entering the pool (after pre-activation).